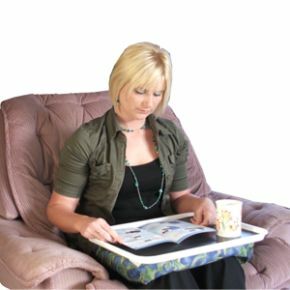 Lap Tray With Bean Bag Support For A Steady Worktop. It is supplied with an Ezee Grip mat size 18" x 14" (457mm x 356mm). Quite good value. Comfortable on the lap, large and non slip. I normally need a new one about every 12 months but to be fair, I use it alot. Probably on average it would last a lot longer than that. So 10/10 for me. It helps me a lot, but I would have preferred a thicker 'bean bag' to bring it up higher for reading, which is what I got it for. However, I just put a cushion under it and that brings it up to the correct height for me.